Harvard University Press, 9780674018297, 350pp. 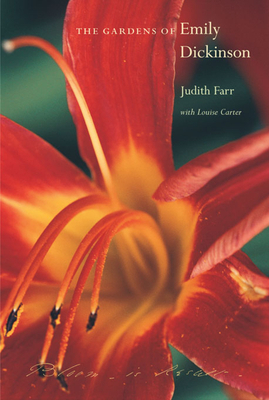 In this first substantial study of Emily Dickinson's devotion to flowers and gardening, Judith Farr seeks to join both poet and gardener in one creative personality. She casts new light on Dickinson's temperament, her aesthetic sensibility, and her vision of the relationship between art and nature, revealing that the successful gardener's intimate understanding of horticulture helped shape the poet's choice of metaphors for every experience: love and hate, wickedness and virtue, death and immortality. Gardening, Farr demonstrates, was Dickinson's other vocation, more public than the making of poems but analogous and closely related to it. Over a third of Dickinson's poems and nearly half of her letters allude with passionate intensity to her favorite wildflowers, to traditional blooms like the daisy or gentian, and to the exotic gardenias and jasmines of her conservatory. Each flower was assigned specific connotations by the nineteenth century floral dictionaries she knew; thus, Dickinson's association of various flowers with friends, family, and lovers, like the tropes and scenarios presented in her poems, establishes her participation in the literary and painterly culture of her day. A chapter, "Gardening with Emily Dickinson" by Louise Carter, cites family letters and memoirs to conjecture the kinds of flowers contained in the poet's indoor and outdoor gardens. Carter hypothesizes Dickinson's methods of gardening, explaining how one might grow her flowers today. Beautifully illustrated and written with verve, The Gardens of Emily Dickinson will provide pleasure and insight to a wide audience of scholars, admirers of Dickinson's poetry, and garden lovers everywhere.